You’ll want to wash your kayak both inside and out with warm, soapy water. It’s important that you get any and all sand out of cracks and crevices. You’ll know you’re done when you’re finally rid of that slimy algae grime. Wait for your kayak to dry thoroughly. You can help this process along by wiping it down with a shammy cloth, but it needs to be completely bone dry before you even think about putting it away. Storing a wet kayak in the winter means a lot of mold in the spring. Spray your kayak with a protectant. There’s a variety of these on the market, but it’s a good idea to choose one specifically for storing your kayak, unless you’re storing your kayak outside. In that case, you’ll want a spray that offers UV protectant as well. Give your kayak a once-over. Tighten any screws and bolts, ensure that everything is where it’s supposed to be, and check for any replacement parts or updates you need to make before you take it out next year. Finally, if you are storing your kayak outside, make sure to take any soft materials, like the seat, out of the kayak. Any outdoor critters, like mice and squirrels, will rip that to shreds if given the chance. Whether it’s inside or outside, a kayak cover is highly recommended. This deters animals and keeps dust from collecting. It’s also a great way to protect your kayak from the elements if it is outside. This is where we’re going to talk about proper storage procedure for indoor kayak storage. If you plan on keeping your ‘yak outside, skip ahead to the next section. Proper Form – Like anything, there’s a proper way to store your kayak, and that is on its side. The sides of your kayak are thicker, and when you expose less surface area to continual pressure, you decrease the chances of warping. So, wherever your kayak is – the garage, the basement, the attic – make sure it’s on its side. Off the Floor – If you do anything, ensure your kayak is off the floor. If you have a rack, great, but if not, it’s a good idea to invest in some affordable foam blocks to put underneath your kayak at evenly spaced intervals. This keeps the weight of the kayak evenly dispersed, decreasing the chances that it will warp over the winter. Suspended Options – The absolute best way to store kayaks is in garages or basements, suspended or hung from some sort of mount. You can choose from tilt racks, which attach to the wall, lift systems, which hang from the ceiling, and even more affordable kayak hangers, which also hang from the ceiling, but don’t have the lifting capability. If you choose any of these options, just make sure the straps and holds are securely under the hull of your kayak. Don’t hang your kayak from the grab loops or ends, since either can break under all the weight. Shield It From the Weather – Kayaks are very susceptible to all weather including precipitation, temperature, and even UV rays. Like we mentioned before, make sure to coat your outdoor kayak with a UV protectant before you store it. Then, find a weather resistant tarp or shed roof to place the kayak under. You don’t want this tarp to actually touch your kayak, just rest above it to shield it from the elements, much like an umbrella. This prevents the kayak from molding. Be Aware of the Weather – It’s important to check on your kayak regularly, especially if it’s been storming or snowing. You’ll want to make sure precipitation hasn’t pooled on the tarp and sunk down to touch your kayak. If it has, just knock it off, and put the tarp back in its umbrella-like position. You should know that kayaks are still sensitive to temperature, so if you live in a very cold area, your kayak could be damaged by repeated freezing and thawing. In some cases, water can get into the seams or joints in the hull, creating cracks. Keep It Off the Ground – Like we mentioned for indoor storage, you still need to keep your outdoor kayak off the ground. To prevent warping, you should invest in some affordable foam supports. Place them under the side of your kayak. This evenly distributes the weight, ensuring no one part of the kayak gets more pressure than another. Once your kayak is cleaned, covered, and stored, it’s time to go inside and warm up! Your kayak should be nice and snug for the winter months and prepped and ready for you to take it out come spring. All you have to do now is wait for the thaw. And if you need something to do whilst you wait, go ahead and check out our Off-Season Conditioning Guide for Extreme Kayakers! It’s got everything you need to stay in shape, so you’re as ready as your kayak for the next season. For any kayak gear, from kayaks to PFDs, make sure to check out the Earth’s Edge website. 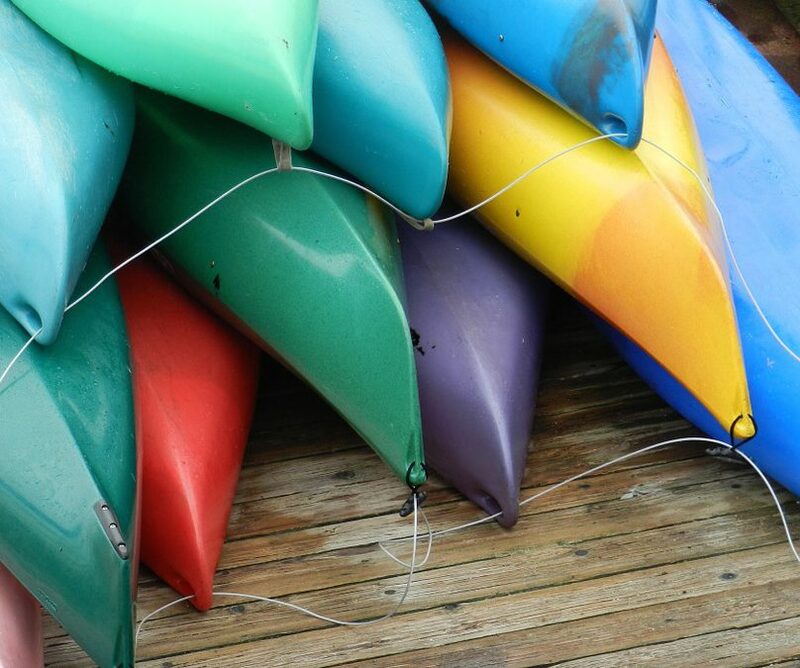 We’ve got everything you need to get your kayak back up and running for the spring season.